Augmented Reality â€“ needs no introduction. Getting increasingly popular not day by day, but second by second, it has been proving its worth as the most modern, advanced technology whose sole aim is to provide a perfect fusion of the digital world and the real world by giving a digitally enhanced view of the real world, getting the users connect to each other for a much better and meaningful daily life. Be it any space or domain â€“ shopping, entertainment, games, finance, healthcare, education to name a few, AR is leaving its mark everywhere. For you and me, it is surely a revolutionary concept, more like a dream which has come true. Unbelievable, as it looks, because of its smart sensors, connected glasses and cameras with mobile devices, it offers a large amount of digital information through GPS services, 3D models, videos, photos and audios of items surrounding us and that too, providing a multidimensional feel to it adding to its authenticity and realness. Augmented Reality browsers fill in your camera feed with appropriate information related to the target element. Attempting to produce the live environment as a mirror image at its best and drawing a very thin line between the real world and the virtual world, Augmented Reality showcases its wonders in real life scenarios like robotics, military services, engineering and more. It is more of a direct view of a physical, real time happening whose basics are supported by computer generated sensory inputs like motion tracking devices, marker recognition with machine vision apart from the traditional audios, videos and photos. This wonderful and innovative technology lessens the gap between the real world and the virtual world by augmenting our sensory skills. What happens here is that the virtual medium creates computer generated environment and is almost near to the real world. It appends graphics, sounds and a feel of the real world to the virtual elements, providing a very similar â€˜real worldâ€™ output to it. No doubt, implementation of AR varies from industry to industry, depending upon the type of requirement lying in there. Marker based technology involves image recognition in which the app overlays the image with some sort of information, with the usage of a camera to capture the image from the real world, finding out its position in order to augment the reality.Â The markers tend to understand a particular pattern as soon as a camera looks at it and then superimposes the digital image at that very point. The very simple example of it is the QR code which you can scan with your camera and get the requisite information from it. This technology makes use of the physical world symbols as a focal point for the computer aided graphics to overlay on. The computer then interprets the symbol to overlay a graphic as it is directly on the top of the physical world marker. GPS based Augmented Reality concept lives on location based applications which use the GPS tools that are fitted in your devices and are utilized to search for the desired information around your location, with the help of smartphones and tablets. Maximum usage lies in places such as restaurants, maps, shopping malls etc., wherein we can easily find out the closest location or the most appropriate location, based on the needed pre-requisites. It makes use of a perfect mishmash of compass, location data through GPS and accelerometer to find out the exact position in the physical world, with respect to the pointing device. 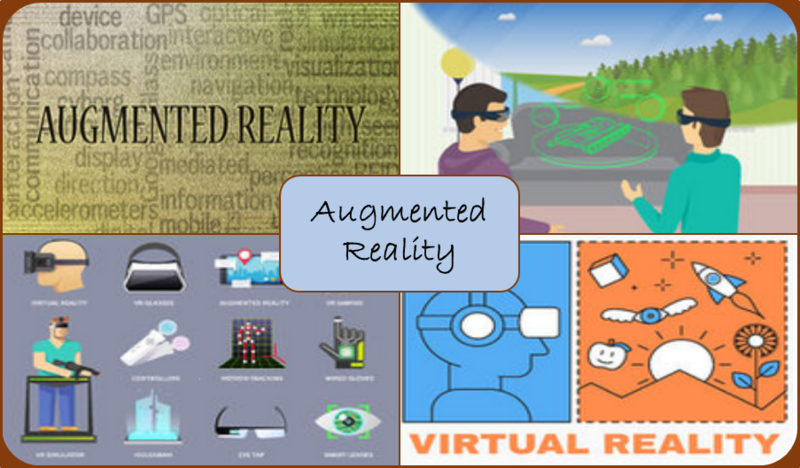 Augmented Reality has been topping the charts of the most modern innovations and its popularity and usage has been exponentially increasing with the passage of time. We will really have to wait and watch for further thrill created by AR. Seems like sheer magic, surely worth the watch and wait. You just need to experience it to know it better. For any of your Augmented Reality Need ..Please visit http://www.valueedgesolutions.com/ Â and request a Quote/Proposal. This entry was posted in Augmented Reality and tagged Augmented Reality, benefits of augmented reality in business. Bookmark the permalink.